Director of Parent & Family Relations Mindy Weixelman recently met with Lafene Health Center Director of Health Promotion Julie Gibbs to learn about the WellCAT Ambassadors, and how the program benefits K-State students and families. Mindy: Hi Julie! I have been hearing wonderful things about the WellCAT Ambassadors program. 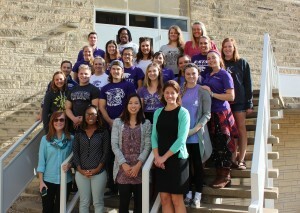 While most K-State parents and families are likely familiar with Lafene Health Center, they may not be aware of the great work you and your students are doing with this relatively new program. Tell us about this leadership opportunity. Julie: The WellCAT Ambassadors program is a peer education program that functions under Lafene Health Center. Students who are interested can fill out an online application. We usually begin accepting applications in late March for acceptance the following fall. The Health Promotion staff reviews the applications and select students to interview. Upon being accepted into the program, students enroll in a class called Interaction and Guidance for the Paraprofessional for the WellCAT Ambassadors program. This is available as a 0-3 credit hour course that helps prepare students to be peer educators through discussions, lectures, readings and interactive exercises. The course is intended as an academic exploration of social health and wellness concerns pertinent to the college student population. It seeks to develop the peer educator’s knowledge of nutrition and fitness, drugs and alcohol, sexual health, time management, stress and sleep. In addition, it will focus on learning presentation and program development skills, as well as its emphasis on different dimensions of wellness. Students are expected to assume roles of responsibility and leadership in supporting and empowering fellow K-State students to make informed healthy decisions. Students will demonstrate high standards for academic accomplishment and presume knowledge of and respect for K-State University resources, policies and procedures. Mindy: The class sounds like a great experience for students who are looking to learn and grow both personally and professionally. Tell me about your role with the WellCAT Ambassadors? Julie: As the Director of Health Promotion at Lafene Student Health Center and WellCAT Ambassadors Advisor, I help instruct the course and also act as a mentor to students as they are preparing to present and/or putting together an event. Mindy: How many staff and students are involved in WellCAT Ambassadors? Julie: We typically have 16 new WellCAT Ambassadors go through the semester long class at a time. We have a total of 35 active members, who meet twice a month for meetings. The students are required to commit to at least one full year of being a WellCAT Ambassador; beyond that it is completely voluntary. We also have two other WellCAT Ambassador Advisors in my office; Megan Katt and Jenny Yuen, who are both Health Educators in the Health Promotion Department. Mindy: Can you share some examples of activities that the WellCAT Ambassadors host or facilitate throughout the year? Julie: The WellCAT Ambassadors typically deliver about 10-15 presentations to students each semester. They also put on one large wellness event, along with two smaller activities each semester. From August 2015 – February 2016, the WellCAT Ambassadors saw 1530 students through presentations and events. Some examples of presentations the Ambassadors have conducted include “Healthy Relationships”, “Nutrition and Stress”, and “STIs 101”. The events have been structured around topics such as sexual assault, body image, nutrition, and stress. The WellCAT Ambassadors try to focus on whatever public health issue is prevalent at that time. Mindy: Wow! That sounds like a successful outreach program. What do you enjoy most about working at K-State and/or with student health? Julie: As one of the WellCAT Ambassador Advisors, I get the opportunity to work with students who are interested in enhancing and upholding the health of their fellow peers. They are also interested in gaining experience with public speaking and event planning. I enjoy assisting them along the way, from start to finish of a project. Even more so, I enjoy watching them succeed. Mindy: I can tell you really enjoy working with students. Share two ways that WellCAT Ambassadors help K-State students be successful. Julie: The mission of the WellCAT Ambassador Program is to prepare peer educators to be: knowledgeable, ethical and caring decision makers. Our goal is to teach them to present evidence-based information to their peers as a way to enhance their quality of life during college and beyond. Mindy: If a student or parent has a question, how can they contact Lafene Health Center? Julie: Students can give us a call at (785) 532-6595, email us at healthy@ksu.edu, or they are welcome to stop by Lafene Health Center located at 1105 Sunset Ave.
Mindy: Here’s my favorite question. What is the best kept secret about the WellCAT Ambassadors? Julie: Many students and parents might think that the WellCAT Ambassadors are students who are only majoring in a pre-health program. However, we have a very diverse group of Ambassadors, some whom are majoring in Accounting, Speech Therapy, Psychology, Education, etc. With this diversity, we are able to reach out to more areas on campus. Mindy: Ok, last chance. Anything else you want to share with parents and families? Julie: Many studies show that by getting involved in student groups, students tend to have higher GPAs and are more successful throughout their college life than those who are not involved. There are a variety of reasons for this, including social acceptance and greater self-esteem. We encourage more students to get involved for this reason!